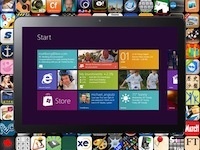 Will Windows 8, Windows Phone 8 and Azure applications flood the market this fall? How many new apps will Microsoft's tablet, desktop and cloud operating systems attract? The VAR Guy expects some answers at Microsoft Build 2012 (Oct. 30-Nov. 2, Redmond, Wash.). Will Windows 8, Windows Phone 8 and Azure applications flood the market this fall? How many new apps will Microsoft’s tablet, desktop and cloud operating systems attract? The VAR Guy expects some answers at Microsoft Build 2012 (Oct. 30-Nov. 2, Redmond, Wash.). That conference, designed for software developers, will arrive shortly after Microsoft ships Windows 8 — and right around the time Apple iOS 6 debuts. Can you say showdown? 1. Tablet Apps Chatter: A heavy emphasis on early applications for Windows Surface and third-party Windows 8/RT tablets. Roughly 33 percent of mobile developers say they are very interested in Windows 8 tablets, according to a recent study by Appcelerator-IDC. 2. Call for Smartphone Apps: A Windows Phone 8 SDK (software development kit) apparently leaked onto the web this week. Microsoft claims there are more than 100,000 apps already available for Windows phones. But only 21 percent of developers expect to launch an application in Microsoft’s Windows Phone Marketplace application store in the next year, Appcelerator-IDC found. In stark contrast, Apple (84 percent) and Google Android (78 percent) will attract far higher app store support. 3. Windows Azure: It’s difficult to say exactly how well Windows Azure, Microsoft’s IaaS and PaaS platform, is performing in the market right now. Microsoft has not released revenue futures for Azure, but the company added 800 new enterprise customers in its most recent quarter. That sounds promising but it’s unclear if those customers are launching big apps or niche offerings on Azure. 4. Windows Server 2012: The VAR Guy concedes — he’s not sure if Windows Server 2012 will be a big topic at Build 2012. Seems like more of a smartphone, desktop and mobile developer conference. Still, ISVs better keep a close on Windows Server 2012, slated for a September 2012 debut. The big push will involve virtualized applications atop Microsoft Hyper-V, all managed by Microsoft System Center. The VAR Guy’s bet: Windows Server 2012 will be a huge win for Microsoft — though debate about Microsoft’s smartphone and tablet app strategy will definitely dominate Build.